Last evening we visited the #PlaceStanislas, the large pedestrianized square in Nancy which is also a World Heritage Site. The sun was setting as we approached the huge gold wrought iron gates and lanterns of the large Square which was surrounded with historic monuments and ornate buildings. 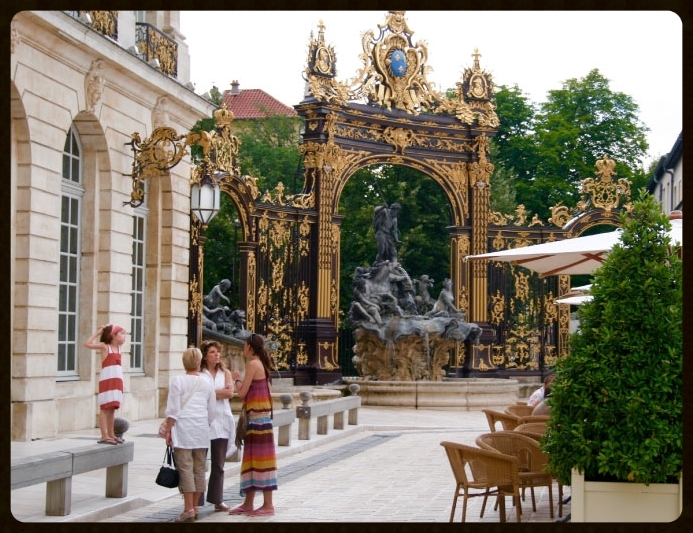 The City Hall of Nancy is on the South side of the square, the Opera Theater and the Grand Hotel to the East and the Fine Arts Museum to the West. The North-West and North-East corners feature ornate fountains. There is also a statue of Stanislas dressed in flowing robes in the center of the Square and the Arc de Triomphe is in the North side. The Square filled with many tourists had several restaurants with outdoor seating. Unable to find a quiet table outside, we had our meal in a restaurant located inside a heritage building. This time I had a big bowl of salad and my friends had their usual wine and cheese platter. It was 8pm and time for an ice-cream. I was told that in Nancy they sell ice-creams made from flowers! I was really looking forward to this very special ice-cream treat that I had never had before. But first there was another treat waiting for me-as we exited the restaurant, I was completely hit by the beauty of the Square in the night. It was lit up in mellow golden lights and against the night sky it seemed as though an other worldly presence had magically taken over the whole Square and also lighted up our souls. We sat quietly near one of the ornate fountains where I enjoyed my very special ice-cream made from hibiscus flowers. Very late in the night, we walked slowly back to the hotel still entranced by the beauty of the golden night-nobody spoke a word.